Combat Preference: Close and personal with a blade of some sort. I have no talent; I make Ready With my Talent. I have no armor; I make Benevolence my Armor. Following this creed allows those of the Infinite One Sword Style to achieve a sound mind, body, and soul which gives them the tools needed in order to master each and every blade they hold. There are a total of six sub-styles to the Infinite One Sword Style, the Mutōryū, the Ittōryū, the Nitōryū, the Santōryū, the Rokutōryū, and the Shichitōryū. Variants do exist among these styles including number of blades, but these are the apex version all leading up to the Mugen Ittōryū, the Infinite One Sword Style, and the Mugen Ittōryū cannot be fully mastered until each of these sub categories are mastered. The Mutōryū is a fighting style dealing with no swords, using their bare fists and arms as weapons. At the apex of this sub-style, a person is able to catch a blade with their bare hand as it is swung at them. The Ittōryū is a sub-style involving only one sword. In this style, one masters the use of a single blade to its fullest and at the apex is able to strike so hard and so fast with a single blade that their targets burst into flames. The Nitōryū is a sub-style involving two swords. In this style, one masters the use of two blades at once and at the apex is able to stab with such ferocity with both blades that they can create craters. Santōryū is a sub-style dealing with three swords. In this style, one masters the use of three blades at once. At the apex of this sub-style, one is able to cut small buildings apart. The Rokutōryū is a sub-style involving six swords. There are variants of this and Santōryū to make a style with four and five blades, but they are usually comparability weaker than their predecessors. At the apex of Rokutōryū, one is able to mince a person apart as though they were paper, leaving their scattered body parts on the ground. The Shichitōryū is a sub-style involving the use of seven swords. Perhaps the most unique of all the Infinite One Sword Style sub-styles, a user must utilize every point of grip on their body in order to use it including the inside of their knees, elbows, and even the hip. At the apex of this sub-style, one is able to end a fight instantaneously with the use of all seven of their wielded swords at once with minimal amount of energy lose and destruction. Once all of these sub styles are mastered, one is able to move on to the true style - the Infinite One Sword Style. Using this style requires a minimum of twenty blades. Quality does not matter to a user of this style, every blade is equally deadly and beautiful to the wielder. The usual way for a person to carry around twenty swords is in a specialized case designed to hold blades in a four by five length to width fashion. Multiple of these cases can be acquired for a truly unlimited feel in the number of swords. At the apex of this style, one is able to use their blades for virtually everything in the way of battle, switching between the main style and the sub-styles at will. One who masters the Infinite One Sword Style is truly a master of all blades. Personality: Richmand's personality is complicated to say the least. Whilst appearing to be nothing but a sadist on the outside, showing cruel displays as though they ere dandelions to be plucked, he has also been known to show random acts of kindness upon those who are in dire need of it. Usually quiet, he doesn't see the need to raise his voice for any such matter. The way he sees it, being quiet makes it so that people have to actually listen to what he says. He is very intelligent, a philosopher of sorts who believes that the shortest path to Paradise is straight through Hell. He is a solitary person by nature, distancing himself from most everyone including his crew. He will, however, defend his crew with his life should it come to that. If there is one thing he shows loyalty to, it is to those who show loyalty to him. Appearance: A mighty man in appearance, Richmand stands six foot eight inches tall and has extremely broad shoulders and a strong yet slender neck. His limbs and torso are both long and well developed, shaped and chiseled into hidden muscles that at first glance may make him look scrawny or weak, but when he uses his muscles they show. He is always wearing a sort of sly smile, like he knows something that all the rest of the world doesn't. His signature clothing set is that of a black cravat embedded with a platinum button with a winking skull carved out of it. Beneath this, he wears a white shirt with a fancy ruffle collar and wrists. Over this, he wears a black captain's coat rimmed with gold that has on the back a picture of a grinning skull, again, winking that he keeps hanging from his shoulders like a cape. His pants are a dark red and he wears no shoes, his feet developing a sort of leather husk from years of wear and tear. Not a man of facial hair, he keeps his face clean shaven at all times while his hair is long, thick, wavy and black and is kept combed back and in a red ribbon at all times. Strapped to his chest and his waist are leather belts and holsters that hold his thirteen blades, which he keeps on him at all times except for sleep. Though during sleep, he will keep one strapped to his waist. Biography: Ragnarok The Destroyer got his start at the young and docile age of six years old. At this time, he was living in Logue Town as little more than a street urchin, stealing what he needed to survive and living off of the scraps. He does not remember his parents and doubts that he ever had any, being just a by product of an unwanted night of procreation was his guess. At six, he had already gained a reputation for being light and fast on his feet, able to sneak into places right under the noses of their owners. It is also at six that his love for pirates and wanting to be a pirate is born. He witnessed the death of Gol D. Roger and wondered why it was that he was executed, but wondered more why it was that his dying words left the world in such an uproar. It intrigued him and he made it his business to find out all that he could about this Gol D. Roger as fast as he could. And did he find out. When he had learned all that he could, or rather all that he needed to learn, he set off to prepare for his adventures as a pirate, dedicating his life to discovering One Piece for himself and becoming the new King of Pirates. At the age of seven, his study and collecting of swords began. It happened by chance that one day while he was sneaking into the marine base on Logue Town to steal something of value (at this time, valuable things was all he was stealing besides food so as to sell them and get funds for his journey to the Grand Line) when he over heard someone boasting rather vibrantly. Sneaking over as close as he dared, he found that one of the marines was telling a new recruit about a pair of swords hung up on the wall, claiming that they were the very blades that killed Gold Rogers. Ragnarok knew he had to have them and so, as soon as the marines were out of sight and ear shot; he shot forth and got whatever he could to help him get up higher on the wall. He took the swords down one at a time and then carried them under his arms as he ran for the exit to the marine base, dragging the ends along with him as he went. On the way, he ran into only one marine and before he could alert anyone he stabbed him in the leg by running forward with the extremely long swords, his first act of violence ever beyond what he did to survive normally. Leaving the marine, he left the base and then ran to his little section of Logue Town as fast as he could, waving the blades threateningly at anyone that got in his way by swinging his body back and forth. For a long time, he just studied the swords really. 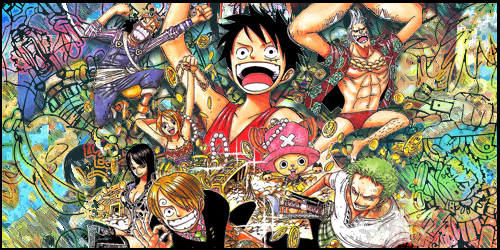 He was awe struck by them, the very swords that ended the life of the Pirate King! And they were his, and would always be his. These were his most cherished possessions, a couple of ordinary execution swords who's most famous kill was that of Gol D. Rogers. It wasn't long after he gained possession of the blades that he wanted to learn how to use them, but his size at the time made that nearly impossible. At best, they were spears to him and he had to wield it with two hands. He knew that if he was ever to get to use these swords, he would have to find a smaller sword to practice with. For a long while, this was impossible and so he kept the swords that had ended the Pirate Kings' life hidden and clean, meanwhile practicing his sword swings with stray sticks and planks of wood whenever he could. For the next two years, he did little else but steal things and make money until he had a hefty amount - enough that he could actually buy his food for once in his life. At nine, he procured his third sword. Walking into the sword shop, he set down a large pile of gold he had brought with him in a sack he had kept hidden under his shirt and told the owner to give him a sword he could practice with. Counting out the gold, the owner told him he had enough to buy at least two swords. Ragnarok shook his head at the time, said he only needed one. So, the shop owner showed him the most expensive sword he had at the time which was a beautiful long sword with a four foot long blade and a beautifully made handle with a rose shaped pommel on the end. Holding it still felt a bit awkward for Ragnarok, but he accepted the sword and gave the shop owner all of his money, leaving with the blade and the sheath that went around it that day. For the next year, he repeated what he had done for the past two years with two changes - the first was he practiced with a real sword and as a result became more and more fluent in the way of the blade. The second change was that he was not as successful in stealing things as he had been in younger life. It seemed his size was working against him now, and on more than one occasion he had almost been caught stealing something. He knew that he couldn't keep stealing for long and that in all actuality it was getting him nowhere closer to his goal of becoming the Pirate King. So, at ten, he gathered up all of his worldly possessions and made out to find a crew who would take a ten year old boy on board who was good with a sword and was good at sneaking. Before long he found one and was made cabin boy on a real pirate ship. There, he befriended a man nicknamed "Shipwreck" for the shear amount of shipwrecks he had survived in his life time, 6 in total. Shipwreck owned a beautiful six foot long katana and taught Ragnarok (on this ship was where he was given the name by Shipwreck himself after revealing to him his dreams of becoming the Pirate King. Shipwreck had laughed and said, "Ragnarok will come before that happens boy!" to which he had replied he'll survive Ragnarok and then go on to become the Pirate King stubbornly, earning him the nickname) everything he knew of the sword. For the next two years, Ragnarok became close to most members on the ship but none more so than Shipwreck. One night, while they were picking up supplies back in Logue Town, Shipwreck got into a duel and lost. Going to him with his last few breaths, Ragnarok comforted him as he passed from life to death, and before he passed Shipwreck gave Ragnarok his katana, making it his fourth sword in total. Enraged, Ragnarok went after the man who had ended the life of Shipwreck with a vengeance in his heart. He left the crew he had been a part of and hopped from town to town, island to island, searching for whom had ended Shipwreck's life. When he found him, he did not hesitate to draw Shipwreck's blade and end the man's life. He challenged him to no duel, he gave him no warning, and he cut him down in cold blood six months after Shipwreck's death at the age of thirteen and took his sword, a silver cutlass. It wasn't enough though; his rage had not subsided at the death of just one man. He went forth from that place and systematically executed anyone who had any sort of relation to the man - friend, family or business associate and killed them all in the same way that he had killed the man, no warning and in cold blood. Before long, his actions became the stuff of stories in bars and of frightened children, a thirteen year old boy known as Ragnarok who was thirsty for blood and would kill anyone who got in his way if given the chance. Because of his systematic annihilation of the man who had murdered Shipwreck's existence, Ragnarok became Ragnarok the Destroyer. Time passed and Ragnarok earned a living however he could, joining one ship to the next carrying with his five swords. At fourteen, he became large enough to properly wield the blades that had ended Gold Rogers' life and began to practice with them daily. At fifteen, he ended up in Mock Town where he heard for the first time the reputation that proceeded him. He simply laughed at it and moved on with his life. Thinking that it was about time he got his own ship and his own crew, he went about forming a crew in Mock Town, at first taking whoever he could get but later replacing some of the vagabonds with some actually men who would be willing to follow someone of his stature, despite his young age. Knowing that he wasn't yet the wisest, Ragnarok surrounded himself with the older and wiser of those who chose to follow him and frequently took their advice on several matters. When Ragnarok became fifteen, he decided that he wanted a ship for he and his crew. He went into a bar one night with three of his most trusted crew members in tow behind him and found a man, drunk off his stool, who was bragging about the size of his ship out in the docks. He could see that there was more than one person there who was thinking of simply gutting the man and then taking his ship for his own, but instead of shedding blood Ragnarok had a better idea. He devised a plan and sent his three trusted advisers forward to speak with the drunkard. The first made him laugh hysterically and then left, the second made him extremely angry before leaving and the last made him sad and told him to call it a night after one last drink, which the drunkard gladly accepted. Stepping outside, he met Ragnarok not far from the bar who challenged him to a game of wits. Ragnarok presented a bag of gold and sat it down in front of him and then pulled out a die and said that if he could guess what number the die would roll on, he could have the gold. Drunk and confused, the man accepted after a bit of prompting and let Ragnarok roll the die, not knowing it was loaded. It landed on a four, one number higher than what he had guessed. Ragnarok drew his sword, the silver cutlass he had taken from the man who killed Shipwreck, and said for guessing wrong he would take his life. The man, drunk and confused, begged for his life and said he would give him anything he wanted. Ragnarok said he wanted his ship and a sword, the man gladly accepted stupidly, telling him a sword was in the captain's quarters. Ragnarok smiled, sheathed his sword, and thanked him, turning and leaving with his three co-conspirators not far behind, leaving the bag of money there as a trade of sorts in silence. Should the man come to him and demand the ship back, Ragnarok would simply say that he had sold it to him, and no one could prove otherwise. Now in possession of a ship, a crew, and six swords, the sixth proving to be a massive great sword he could hardly lift, Ragnarok's first order to his crew was to paint in black and put in red letters on the back "The Fourth Horseman," the name of their ship. So it came to be that he had a reputation, a crew, and a ship. It wasn't quite enough though; he was still so young and was still so inexperienced. He devoted the majority of his time to practicing with his swords, developing his own unique style while at the same time trying to work up the strength to not only lift and swing the great sword but to use it magnificently as well. Subsequently, leadership, but not ownership, of The Fourth Horsemen passed over to his three closest advisers. As time passed more and more, the three men who were step in captains for the ship began to plot to usurp Ragnarok from his position as captain of the ship. He only found out about it off offhandedly, hearing a rather loud crew member over speak about the plan. Ragnarok dealt with him quickly and then moved on to his three most trusted advisers. He crippled each of them, going for their legs and their arms, and then took them out on deck to keel haul them, tying them to thick ropes and letting the barnacles on the bottom of the ship teach them a lesson. He left them to die instead, the lesson being death to all who try to betray him, all. He had genuinely been hurt by this betrayal and went through each of his crew members and made them tell which of them was going to do what to try and steal away his captain-ship. Those who were directly involved in it got he same treatment, keel hauling off the side of the boat. From then on, Ragnarok was the permanent captain of the ship. From there, they went on to do some real plundering, focusing mainly on the competition rather than towns or individuals. From each ship they attacked, Ragnarok took the sword of each captain he himself slew and over the course of fourteen years; he collected a lot of swords but kept few for combat. Only the most beautiful would do, and each time he gained a new sword, he practiced with all of the ones he had, furthering his style and mastery of the sword. Because of this, Ragnarok the Destroyer also became known as Ragnarok of the Thirteen Swords. All the while, he slowly moved towards his goal of finding One Piece. The only reason he hadn't gone after it yet was because he was not confident in his skills not only as a swordsman but as a captain and with a strong crew. He wanted to make absolutely sure that he was ready to take One Piece when he did, he wanted no mistakes. So for fourteen years, he bide his time and collected swords, slowly become as strong a person as he could be. I can tell you have put a lot of time trying to create your total badass, vengeance loving, sociopath character and to be perfectly honest I love the idea. However there are many issues that you have to resolve before your character can be accepted. I'll start in what I believe are the most urgent of issues. 2. You quite often use the wrong tense, At this time, he is living in Logue Town as little more than a street urchin, stealing what he needed to survive and living off of the scraps. Using is instead of was. This happens quite a few times throughout your entire application. 3. This bugged me than it is a need however, The Pirate King, was a nickname thus should be Capitalised. Not a man of facial hair, he keeps his face clean shaven at all times while his hair is long, thick, wavy and black and is kept combed back and in a red ribbon at all times. Repeating and over and over and over again. Makes the writing become dumbed down when I know for a fact that your use of the English language can be quite inventive. Using semi-colons instead would have made it far easier to read. Not a man of facial hair, he keeps his face clean shaven at all times, while his hair is long, thick, wavy and black; it is kept combed back and tied in a red ribbon at all times. 5. When referring to something such as this; It happened by chance that one day while he was sneaking into the marine base. Since there is more than a single Marine base should have been a Marine base rather than the. Also Marine should be capitalised as it is the name of something, whereas referring to a marine as a person shouldn't be. 6. The blades that ended Gol D. Rogers life were a pair of long bladed Naginata, so I think the chances of a small seven year old child being able to carry them are very slim. I'm not saying your story would be impossible just that, at seven year's old regardless of lifestyle carrying two of those would be improbable. 7. Your paragraphs become quite bogged down as you have many different things happening in them at once, a nice rule of thumb to use is; after a change subject, there should also be a new paragraph. Most of these things seem to plague your entire application. On a final note, you still need to post up your fighting style to complete your application. I'm sorry if this seems harsh, but I really want to try and help you iron out as many kinks as possible so that your character can get accepted asap. If you have any problems don't hesitate to ask me and I'll help. So if you can go through your application keeping an eye out for things like this it will read hundreds of times better and no doubt we can accept you. Alright, I'm happy that you've made the changes I asked. Your sample mission is good too. I'm not 100% happy with you starting off already in the Grand-Line, mid way through the first half as well. So your going to have to earn that reputation that you've given yourself, something sharpish. So yeah, your Character is accepted. Post your sample mission up here. Then you can start earning your DP, have fund and good luck.